The completed grid contains (almost) two rows symmetrically placed, depicting a villainous man, first mentioned a little over 50 years ago, and his original setting. By changing two entries, one in each of these rows, solvers must depict a different man, more often heard than seen nowadays, and something essential to his setting. 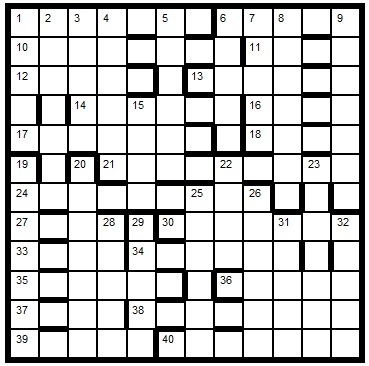 Finally a total of three letters must be erased from two separate entries to show a pair of combatants for one 11 appropriate to the final grid. Down clues each contain a misprint of one letter in the definition. The correct letters spell out a phrase which should help identification. All entries in the final grid are real words. To enter this competition, send your entry as an image or in list format, to ccpuzzles@talktalk.net before the 8th November 2015.The first correct entry drawn from the hat will receive a book from the Chambers range which has been donated by Chambers.